I originally developed this cookie recipe for a gift basket I was shipping to a friend (Hi JP!). Literally moments after he opened the package I received an elated text raving over the White Chocolate Reese’s Pieces Peanut Butter Chip Cookies I had sent. I knew then and there I needed to make them for YOU – and fast! The base recipe for these delicious cookies is nothing new. 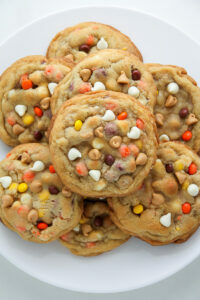 I have a trademark recipe for cookies I developed a few years ago and it is what I use 99.9% of the time when I bake. Would you believe my triple chocolate cookies, salted caramel stuffed chocolate chunk cookies, and flawless chocolate chip cookies are all made from almost the same exact cookie dough? The best part? My base cookie dough is made with simple ingredients you probably already have in your pantry. Flour, sugar (brown and granulated), baking soda, salt, eggs, and vanilla. ← Nothing fancy here. It’s simply the perfect measurements and a consistent method that takes these basic ingredients and transforms them into thick and chewy cookies, every-single-time! 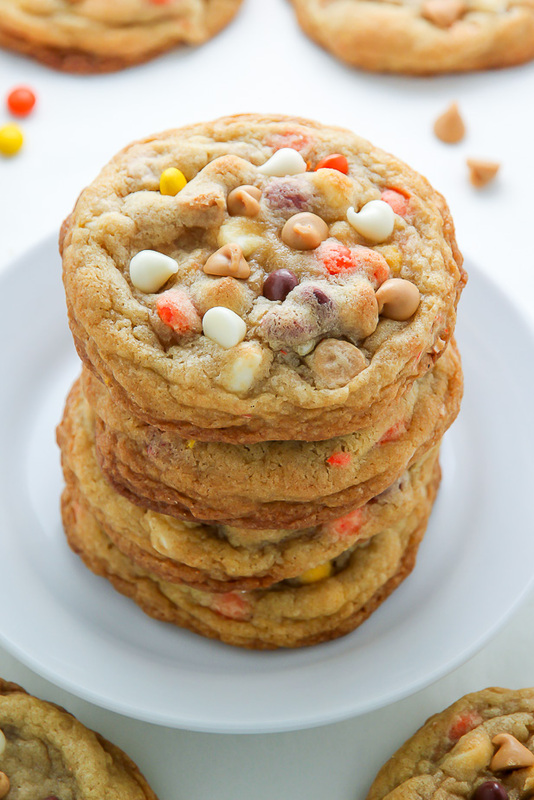 For these cookies you’re also going to need to get your hands on white chocolate chips, peanut butter chips, and Reese’s pieces. I used the mini Reese’s pieces (they’re so cute), but full-sized will work too. These cookies bake up with crispy edges and supremely soft centers. ↓↓↓ Look at that plush cookie interior! Loaded with so many goodies, too. Pure bliss. 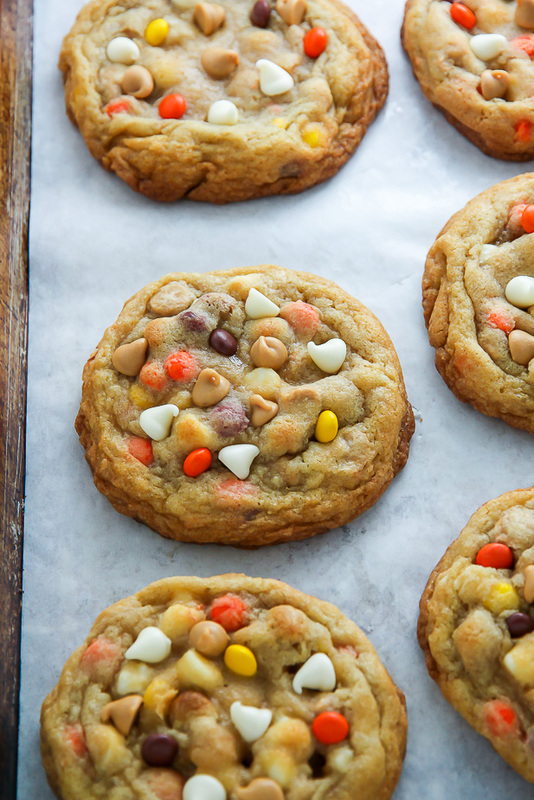 These cookies bake at 375 degrees (F) for 11 minutes. They will look pretty soft when you remove them from the oven. Not to worry – the cookies will firm up greatly while they cool, so be sure not to over bake them! 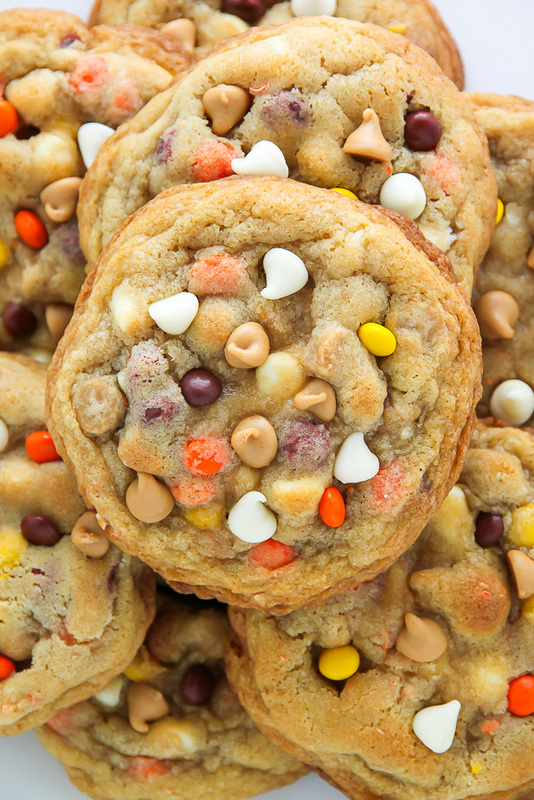 If you’d like your cookies to look just like mine, gently press a few peanut butter chips, white chocolate chips, and Reese’s pieces on top of the cookies right after they come out of the oven. It’s important you do this right away – while the cookies are still soft. Let the cookies rest on the baking sheet for 5 minutes or so before transferring them to a cooling rack. 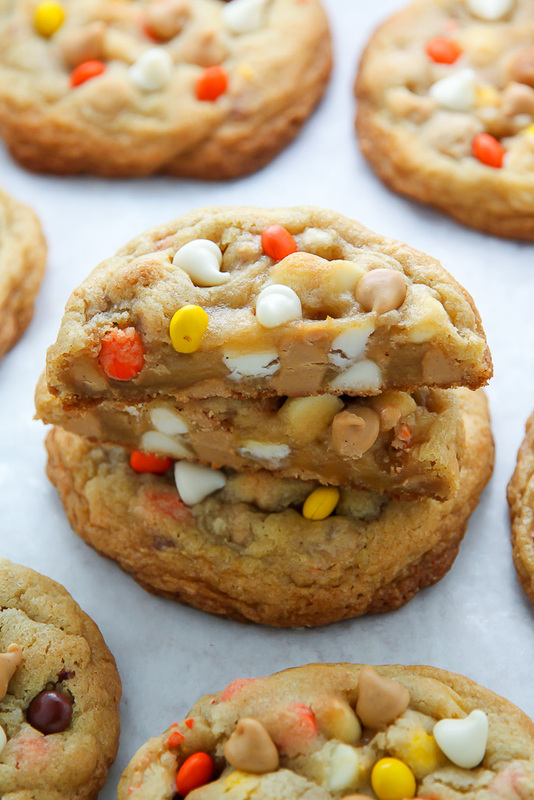 Make today’s White Chocolate Reese’s Pieces Peanut Butter Chip Cookies for all your Fall festivities! They will definitely be making an appearance at our Halloween party… and you know I’m packing a few for our flight on Saturday. 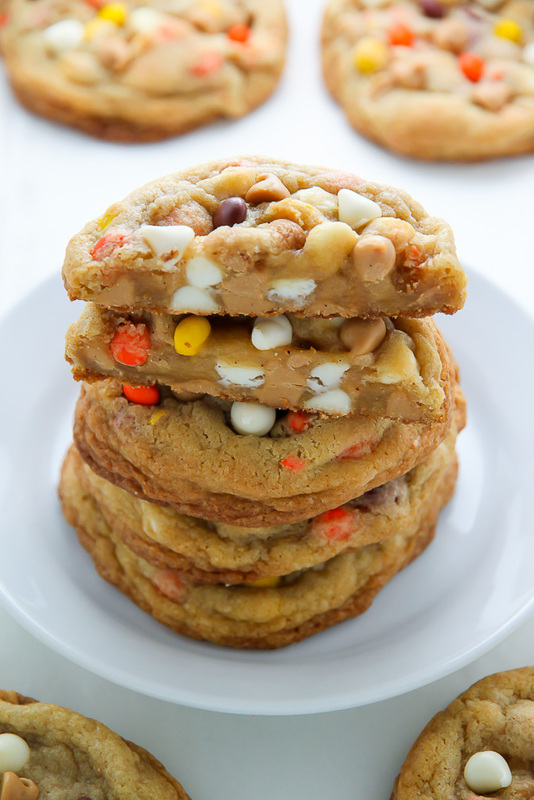 Thick and chewy White Chocolate Reese's Pieces Peanut Butter Chip Cookies are sure to be a new favorite! Preheat oven to 375 degrees (F). Line 2 large baking sheets with parchment paper and set aside. In a medium sized bowl whisk together the flour, baking soda, and sea salt; set aside. Add the sugars, vanilla, and butter to a large bowl and whisk until light and fluffy; about 2 minutes (I recommend using a stand mixer/ handheld mixer to help here, if you have one). Add the eggs and beat quickly – for only about 30 seconds – until they’re just combined. Let the mixture rest for 5 minutes, then beat the eggs for another 30 seconds. Gently fold in the flour mixture with a rubber spatula, stirring only until the flour begins to disappear. 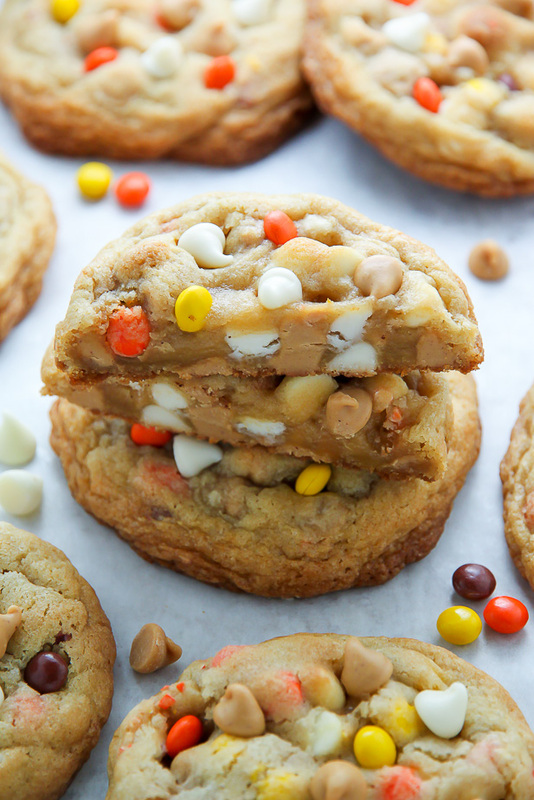 Fold in white chocolate, peanut butter chips, and Reese's Pieces. Roll 3 tablespoon sized balls of dough between your palms to form a ball (they should be big; almost a 1/4 cup), then place on prepared sheet (make sure to leave enough room in between each cookie for inevitable spreading). Continue this process until all the dough has been rolled. Place baking sheets in preheated oven and bake for 11 minutes, or until golden at the edges but still soft in the middle. Let cookies cool for 5 minutes on the sheet before transferring to a wire wrack to cool completely. omg yum! gosh so pretty! love this so much! AHH I WANNA GO TO NOLA! Have fun! 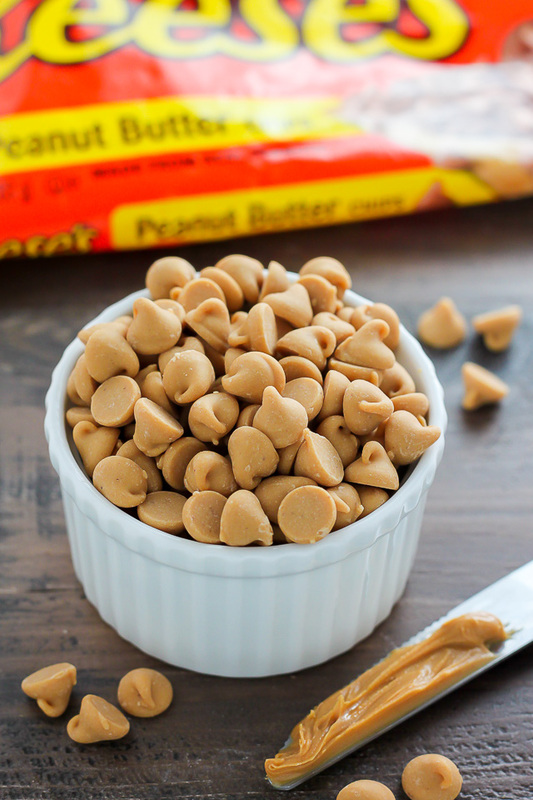 Love how chewy and loaded with peanut butter these cookies are! Yum! I have a question about the butter,though. It says 2 sticks but the recipe only adds up to 15 tablespoons. Am I missing what to do with the extra tablespoon? Can’t wait to try these! Hi Erin! Whoops – major typo on my end 😉 Thank you for catching that. The proper recipe notes have been added. Please let me know if you have any additional questions. Enjoy! It looks so good. Thanks for your dedicated recipe. Why don’t you have the ability to search for recipes on your blog? It would really be an improvement. Hi Theresa. There is a search box on the left hand side bar. Hi Vanessa! I’m so happy this recipe found you 😉 I suggest using a wooden spatula to fold the chips in, if you have one. If not, you can do it with an electric mixer, just be sure not to over mix. How did the cookies turn out for you? These were so delicious! I brought them to work and everyone loved them. Next time, I might take a wee bit less sugar, but that’s only nitpicking. I will use your basic recipe for cookies all the time now because these turned out SO. GOOD 😀 Also, I didn’t have Reese’s Pieces, so I just chopped up some Reese’s and put them in there. Yum. So yummy at first sight. My kids love chocolate very much. I will surely try to make this for my kids and hope they love is. Thank you so much for sharing this post! It looks very delicious. I love this cookies recipe. Thank for share ! I may have missed this but do you brown the butter for this recipe as you do for the caramel sea salt cookies and your everyday cnoc chip cookie recipe? Hi Pam. I didn’t brown the butter for this recipe. I just used unsalted butter, softened to room temperature. The recipe says salt, but instructions say sea salt. Can you clarify, please? Can you make the batter 1 day ahead of time and refrigerate overnite? Hi – Mine ended up really dense and heavy…not gooey and flat like the pictures. It almost seems like I added too much flour? I tried to be very careful not to over mix but perhaps that’s what I did? Any thoughts on what I did wrong? Your photos look DELICIOUS and I want to try again. Thanks! Hi! Does the salt have to be sea salt? Also, can you make the batter a day in advance and refrigerate it? Thanks! Wow, this was a great recipe. And I agree with your post, this is a great cookie base for other types of cookies. I use it for good old chocolate chip walnut now too! Thank you! Oh my…these look divine! I can just imagine two of these with a big scoop of vanilla ice cream between them. Bliss! white caramel is a gift from heaven! Just by looking at it, is making me crave for it! Perfect for the season. 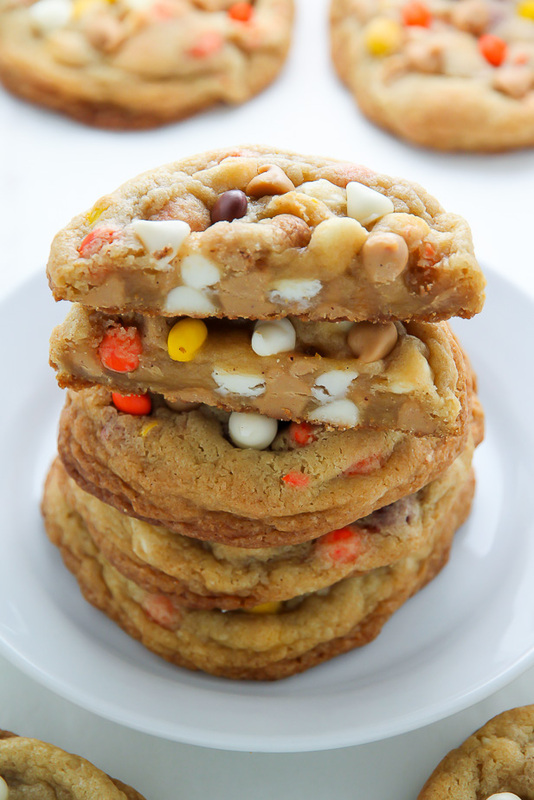 Honestly after watch your “Peanut Butter Chip Cookies” photos I am hungry for taste it. Hope upcoming valentines day I will surprise to my girlfriend by make it. Thanks for sharing with us. Hi! Does the salt have to be sea salt? I subbed out a 1/4 cup of peanut butter in for 1/4 cup of the butter. 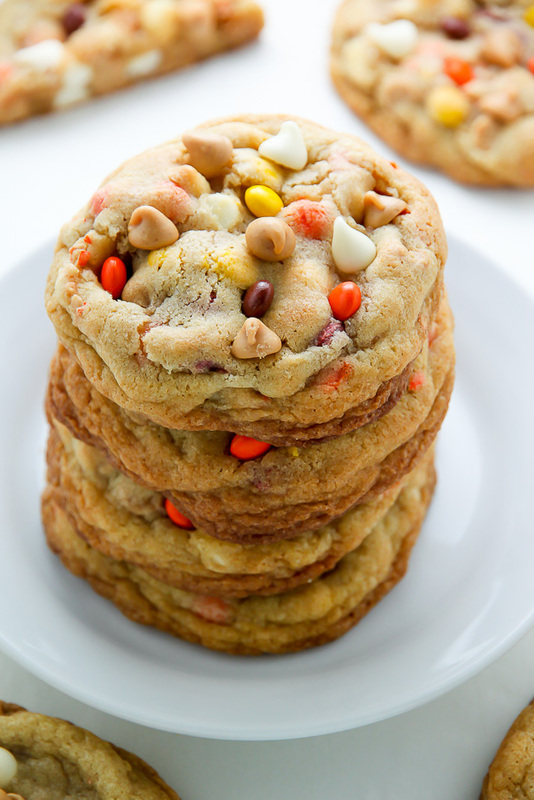 No reeses pieces just pub chips and white chocolate chips. 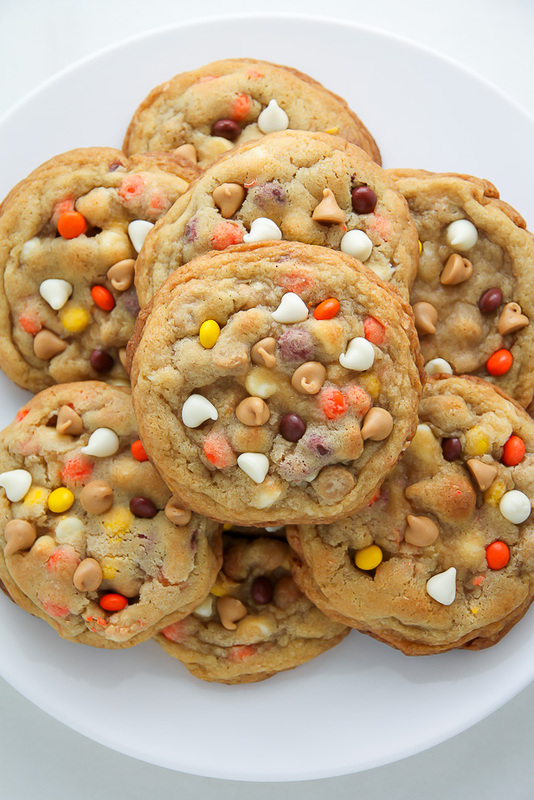 Question: the directions state add the white chocolate chips, peanut chips and reese’s than roll into a ball but as I read everything from top to bottom you wrote to add the above once the cookies come out of the oven – this can sound confusing? Hi Carmen. Sorry for the confusion! Yes – you add the called for chips into the batter, then you can add a few more when the cookies come out of the oven, if desired. I hope that helps! Hi! Look so yummy! Can I freeze the dough ahead of time and make later? 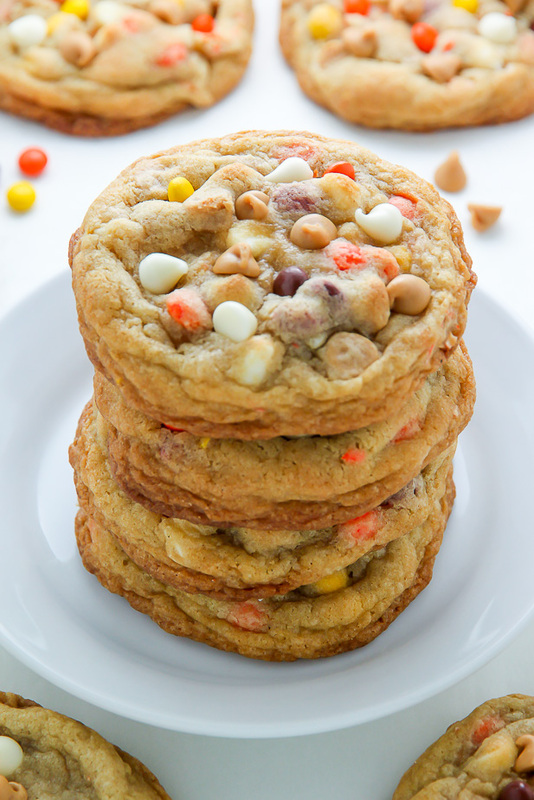 Chocolate flavor cookies is my favorite and i like to make this recipes. Hello, do these need to be refrigerated before cooking? Thank you! Hi Ashley, I’m looking forward to baking these cookies in a couple days. My question for you is: Can I make the dough ahead of time? If so, should I refrigerate or freeze it? Please let me know as soon as possible. Thank you in advance! Curious about high altitude baking for these? I always have trouble getting any baking correct. I’m at almost 7,000ft elevation and want to make these for a party this weekend! Thanks! I’ve made this recipe so many items since I first tried it that I finally had to comment. These cookies are amazing! I’ve given them to friends and brought them to work and everything loves them. 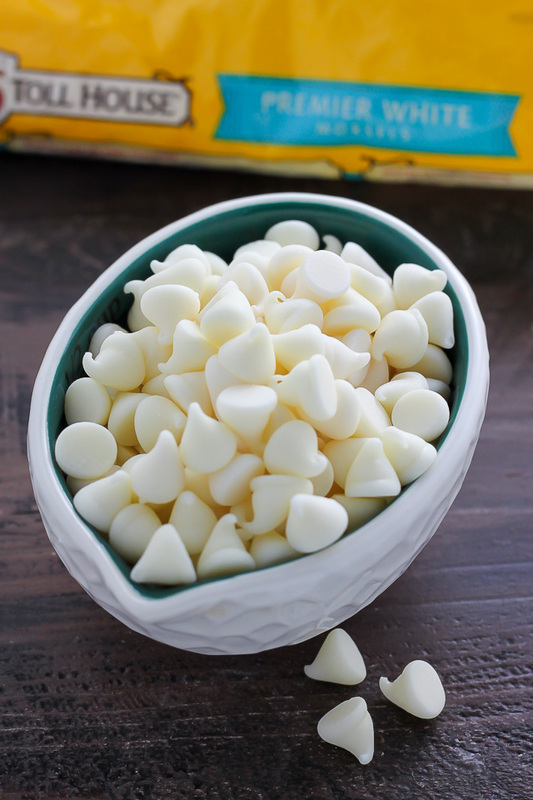 The only change I make is using a mix of semisweet chips and bittersweet chips instead of white chocolate. I couldn’t find mini Reese’s Pieces so I use the regular size. A trick to having fresh cookies anytime: make the dough, use a large ice cream scoop to form balls, put cookie dough balls onto baking pan lined with parchment paper, then pop into the freezer. Once the balls are frozen transfer them into a freezer bag and put back in the freezer. Then whenever you want a cookie just take one out and bake! Thank you so much for sharing. Delicious cookies! I love both white chocolate and peanut butter so much. They came out really good.